Just in time for November (the month the Church remembers in a special way those who have died) comes a ghost story by Catholic fiction writer Kaye Park Hinckley. Carroll O’Murphy founded the town of Faithful during the Great Depression. 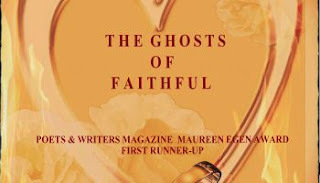 The Ghosts of Faithful takes place 75 years later with his daughter and granddaughter suffering under the weight of secrets. Carroll’s daughter Kathryn just kicked out her husband for a decades-old indiscretion. Kathryn’s older daughter Cornelia is trying desperately to keep up appearance despite her world crashing around her, while younger daughter Izzy has never recovered from the trauma of something that happened to her when she was fourteen. To make matters more complicated, Carroll’s widow Rose still talks to Carroll as if he is in the room with her. She also claims to be taking care of an invisible seven-year-old girl. The Ghosts of Faithful is an interesting story about the veil between life and death, the burden and consequences of sin, and the power that our secrets can hold over us.